After two straight Orange Bowl defeats, the 1981 Florida State Seminoles were cruising along with victories at Ohio State and LSU and then, it all fell apart. Close losses to Miami and Southern Mississippi followed by a 35-3 clobbering to wrap up the season. The team sputtered down the stretch to a 6-5 record. It was the low point of a relatively young Bobby Bowden’s career. It was also the last time the Seminoles did not qualify for a bowl game. What started under a legend in Bobby Bowden, and continued through the much shorter Jimbo Fisher era, has come to a crashing halt under Willie Taggart. The first-year coach has seen his team struggle all season. They have immense talent but seem to consistently underperform. The games they won were mostly nail biters and often against inferior competition. The losses shook Seminole fans to their core. The thought of losing to Miami (FL), Clemson, Notre Dame and Florida all in the same season is almost too much to comprehend. And they were outscored by a combined 106 pointS in those four contests. On Saturday, it was just more of same. If this is the new normal, Taggart’s time in Tallahassee will be brief. After stopping the Gators early on a 4th-and-goal, there were signs that the Seminoles would not go down without a fight. But a steady stream of three and outs followed by defensive breakdowns had the Seminoles in a 13-0 hole approaching halftime. When Cam Akers reeled in a 15-yard Deondre Francois strike for a touchdown, Florida State was temporarily brought back to life. However, that was the last we would hear from the Seminoles. What followed were two interceptions and a fumble ultimately resulting in an embarrassing 41-14 defeat. For the Gators, Tallahassee born Feleipe Franks was exceptional. 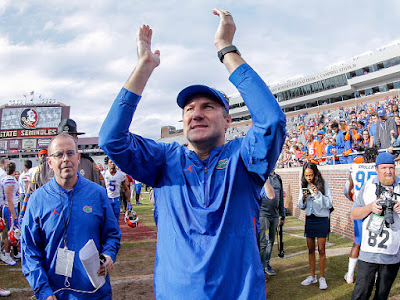 “I’ve always wanted to come to Tallahassee, always wanted to play Florida State and I’ve always wanted to get obviously a win here specifically,” Franks said. Franks ended with three touchdown passes including one to junior standout, Josh Hammond. Chauncey Gardner-Johnson said this was a collaborative effort on defense. With LSU losing a dramatic overtime thriller to Texas A&M, Florida is now awaiting an invitation to a New Year’s Six bowl game. An incredible accomplishment from a team that won four games in 2017. Florida coach Dan Mullen puts it all into perspective.